Today is the last day of October and that means two things: 1) National Pasta Month is coming to an end and 2) We start the 24-hour countdown before I’m allowed to say the words “Thanksgiving” and “menu” out loud. So let’s talk about the former. That dish up there, that is Roasted Broccoli Carbonara. It’s our favorite carbonara pasta recipe made over to be a little more nutritious of a one-bowl dinner. Because let’s be real, most of us could probably use a little green stuff to help offset tonight’s candy binge. Peanut Butter Kisses for the win! Am I right?! That candy has never gotten the respect it deserves. But back to the carbonara. The sauce is a more traditional eggs, parmesan, and bacon mixture with a generous dose of black pepper (and the pepper is simmered so it infuses the oil that much more). A few splashes of pasta water, some penne, and a pan of roasted broccoli later, you’ve got dinner on the table in about 30 minutes. And with plenty of room left for that late-night, quality assurance inspection of your kids’ candy haul. 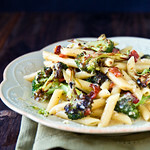 Roasted broccoli replaces half of the penne to lighten up this traditional pasta carbonara a bit. Bring a pot of salted water to boil and line a baking sheet with foil. Cut the broccoli into medium florets and place on the baking sheet. Drizzle with 3 Tbsp olive oil, toss the broccoli to coat (hands-on works great, gets everything evenly coated), and sprinkle with a generous pinch of salt. Roast for 12-15 minutes, until nicely browned. 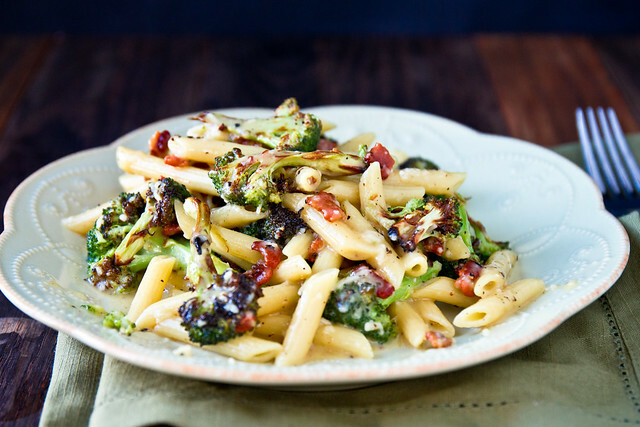 While the broccoli is roasting, cook the pasta and the bacon - everything will be done at about the same time, important because the pasta and water need to be hot. Heat 1 tsp olive oil in a saute pan over high heat and add the bacon, cooking until almost completely crisped. Add the black pepper and when bacon has completely browned, remove from heat and transfer to a large bowl (big enough for mixing the entire recipe). Mix the eggs and 1 1/2 cups cheese together in a smaller bowl, then add to the bacon mixture, stirring to mix well. Add pasta to boiling water and cook per package directions. Set aside 1 cup of pasta water and then drain the pasta. Immediately add the hot pasta and a splash or two of the hot pasta water (~2 Tbsp at a time) to the bowl, while stirring vigorously to create a creamy sauce. Add the broccoli, toss to coat (adding additional water if necessary). Love the addition of roasted broccoli! We call it the Candy Tax. All children must pay a Candy Tax to both parents before eating any themselves. Oh, and we get to pick it ourselves; no Smarties or cheap suckers for Mom and Dad. Great idea for a carbonara! Yum, I love the additional of the roasted broccoli in this dish. Broccoli and pasta is one of my favorite combinations. Mmm I love roasted broccoli but have never thought to put it in pasta. Looks delicious. I love the broccoli addition. I haven’t had the Peanut Butter Kisses yet, but if they are peanut butter, and they are Kisses, I am on board. Oh yes. I coudl use a bowl of that. i’m putting off devouring a bag of Reese’s until after the marathon…but after THAT…I could certainly use this to atone! Looks divine, Shawnda! And, peanut butter kisses? How on earth did I miss their existence?? This photo is mouth watering! Can’t wait to try this at home. Looks delicious! So simple, but lovely. My daughter is still too young, so we won’t be dealing with loads of candy yet! Love the recipe. My son once made me a carbonara but it is one dish I have not actually ever made my self. I am thinking hubby might even like this. Now onto the peanut butter kisses, do you mean the old fashioned candy that was a molasses taffy with peanut butter in the middle of it? Those are quite tasty. Wish I would have bought some when I was at the store today. This is right up my ally. Love roasted broccoli and carbonara thanks for sharing!! 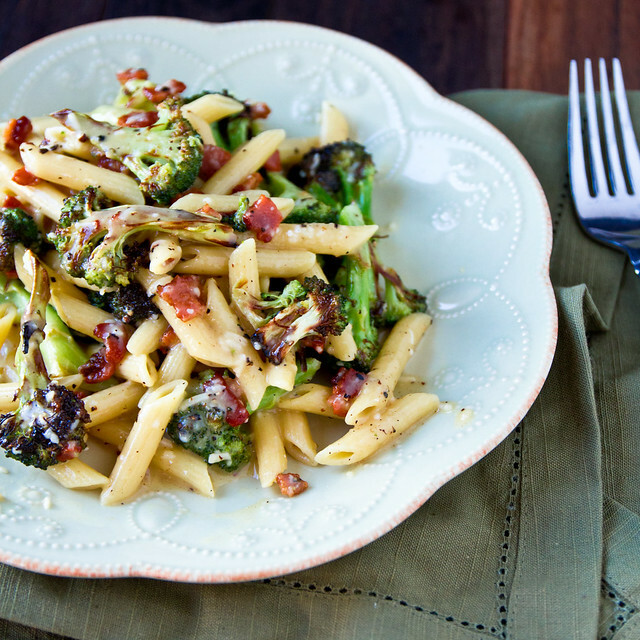 Your Roasted Broccoli Carbonara looks amazing! I shall try the recipe tonight. Roasted broccoli is to die for. Seriously so good, and put into a carbonara? It probably just gets better. Great recipe! Broccoli in carbonara sounds just delicious! Just made this after finding it on pinterest. Looked so delish. I’m a pretty good cook and this is the biggest fail I’ve had in a long time. I followed your instructions and my sauce is runny with clumps of cheese. What did I do wrong? We had this for dinner tonight and it was amazing! Never made carbonara like this before and was a little turned off by the idea of the eggs. It was so good that we had no leftovers. Great idea for a carbonara. Looks good! I tried a grilled broccoli & pasta combo this summer, and it was very good. So on the lookout for more ways to serve broccoli. Thanks for the recipe!! I made this tonight using vita spelt spaghetti and added chicken to the bacon fry. We loved it. Will make this again. I’m a little concerned about the raw egg and yolks. Isn’t it a bad idea to eat raw eggs? Isn’t there a way to make sure they’re cooked. Sorry. The rest of the recipe sounds so fantastic! You’re immediately adding the boiling water from the pasta to the eggs to create the sauce. I made this for my family of 4 and It was FABULOUS. Thanks for the great recipe. I will be sharing this one.